Amateur Bodybuilder Of The Week: Massive Muscle! Nidal believes he can accomplish anything. He knows no limits. This monster snuck into gyms, scavenged for free passes, and lifted heavy iron to get where he is today! When I was kid, I wanted to be an action hero like Stallone, Schwarzenegger and Jean Claude. I know the Rocky movies by heart, but the one that stands out most is Rocky IV. When I saw the second training montage in that movie, my mind was set. I knew what I wanted to look like. The image of him lifting the wheel barrel with his popping biceps and major vascularity is forever instilled in my mind. My neighborhood held a community yard sale in the fall 1991. I ventured from house to house with one dollar to my name and stumbled across a gold plastic sand-filled 8-pound dumbbell that cost exactly one dollar. It was meant to be. Every day after school, I ran home, turned on the radio, and curled away. I was introduced to weight training during my sophomore year of high school. Our instructor taught us basic movements and exercises like squats and bench press. I was playing football, basketball, and running track, so my workout program was tailored to whatever sport was in season. I got more serious about weight training and bodybuilding after high school. I weighed 158 pounds during this time and wanted to add more lean mass to my frame. I wasn't attending college at the time. I mostly hung out with friends, worked odd jobs, and had plenty of gym time. I went to a local gym every day with knowledge from high school (bench and squat). I did a lot of people-watching to find a physique I admired and could copy. My training experience was expanding, but my diet was a mess. My friend wanted to build muscle, so he joined my gym too. We went to the gym together, read fitness and bodybuilding magazines, and built a routine that trained one muscle group per day. Our diets weren't a priority. Years went by and our schedules differed, but we continued to train. I vividly remember one stretch where money was tough to come by and the majority of my income went to pay for community college. I wasn't able to keep my gym membership during this time, but I found ways to get free one-week passes from the local gyms in the area. When I used those up after three months, I drove to a 24-hour gym 20 miles away at 1 a.m. This gym had a staffing issue and the front desk was frequently vacated during the midnight rotation shift. My friend's very successful uncle once told me that no one could do what he did to bring him where he is today. Since hearing those words, I knew I wanted to tell a similar story one day. This training regimen lasted for the next eight years. At age 27, weighing approximately 184 pounds, I started getting stricter with my diet. I cut out fast food, fried food, soda, and made healthy choices when dinning out. I followed this approach Monday-Friday and let loose on the weekend. My gym routine followed a similar approach. I worked on form and tweaked different exercises to get better results. I added a warm-up at the beginning of my workouts that consisted of 40 pull-ups, 35 push-ups, and 30 crunches and completed the cycle three times. This prepared my body for grueling workouts. I'm in the best shape of my life at 34. Most people regress and wish they had the body from their 20s, but I kept progressing and bettering myself. My routine focused on training one muscle group a day, changing exercises every two weeks, and doing light work on the opposite muscle group between sets. I went with an organic approach to my diet. If I can buy it organic, then organic it is. For the past four months, I've eliminated gluten from my diet. I attribute my latest muscle gains to this change. The elimination of gluten helped me put on more lean mass by eating more protein, veggies, and fruit. Anyone who has a hard time keeping or gaining weight should give it a try. I've gone from eating 2-3 times a day, to 5-6 times a day. My cardio comes from competitive sports I played since the end of high school. I play in a competitive men's flag football league and compete against ex-pro and college level athletes. I'm learning something new constantly. I recently just hit my goal to weigh a solid 200 pounds. There's no off-season bulking or cutting for me. I strive to better my physique every day. Working one muscle group or body part a day delivered the best results. Each muscle gets four exercises with four sets. Repetitions range between 8-15. I use 15 reps as a warm-up and during sets I let my body dictate the repetitions. Every workout starts with a warm-up routine consisting of 40 pull-ups (total after 3 cycles), 35 push-ups, and 30 crunches done in three total cycles. I make sure to drink two gallons of water daily. I don't have a strict diet. I make healthy choices (organic when possible), get 200-230 grams of protein daily, and avoid gluten. Below are regular items I've consumed during the past year. When I eat out, I usually get a salad topped with a double portion of lean red meat. What supplements I take generally depend on my budget for that month. Supplements I make sure I always have are: Whey protein, and my multivitamin. It all stems from my childhood. I idolized action heroes and wanted to look like them. I want to push my body to its limits. I love feeling my muscles grow, become more defined, and the pump that stretches my gym shirt. I love the endorphin high from the weights that put me in the zone with my favorite tunes blasting through my ears. It's a mood-enhancing rush that can't be matched. It's like watching the stages of my life flash through my mind in an unadulterated, euphoric state. Some men go to the bar; Nidal gets under it. Watching Rocky IV started it all. It lit the fire in me. Sports molded my body and I was able to transition into bodybuilding and rekindle the initial inspiration from childhood. I love music and always make sure I have it with me at the gym; today's hits or my favorite 80s tunes. Music always lifts my mood and enhances my gym experience. I use the athletes I looked up to growing up: Michael Jordan and Bo Jackson. Watching their highlights hypes me up. If I need instant inspiration, I can always count on the Rocky IV training montage. That clip is where it all started for me. I hope to compete in my first natural bodybuilding contest in 2013 or late 2012. Hopefully I can earn my pro card and do some fitness modeling to earn a few extra bucks. It would be an added bonus if I picked up a sponsor to help me. Who knows from there? Maybe it's my turn to be a movie action hero. A tip I give to other bodybuilders is to dedicate yourself. I come across people all the time who have unrealistic expectations. Bodybuilding is a process and everyone is built differently. I come to the gym every day with the same goal. I want to leave feeling satisfied with my effort and a skin-ripping pump. Every day you get to the gym is a day closer to your overall goal. It's a learning process. I'm still learning to this day. Built by dedication, heavy iron, and maximum effort. I admire physiques of bodybuilders from the 70s and 80s; Arnold Schwarzenegger, Frank Zane, Serge Nubret, and Steve Reeves from the 50s. They had the classic V-shape we all seek and admire and an awesome combination of muscle and leanness. Bodybuilding.com delivers supplements at a great price. BodySpace helps me connect with fellow athletes and bodybuilders and is a great resource to find specific information related to training tips, contest preparation, diet, and supplement reviews. 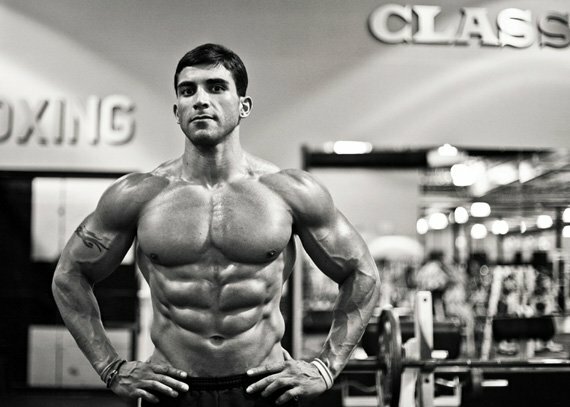 Bodybuilding.com has every corner covered. No other site comes close.